(video) A Nao robot at the Fêtons Linux in Geneva, Switzerland, in October 2011. 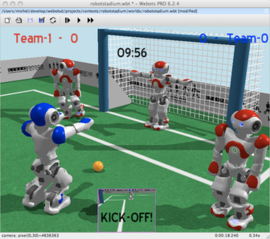 Nao robots in a Webots RoboCup soccer simulation. Nao (pronounced now) is an autonomous, programmable humanoid robot developed by Aldebaran Robotics, a French robotics company headquartered in Paris, which was acquired by SoftBank Group in 2015 and rebranded as SoftBank Robotics. The robot's development began with the launch of Project Nao in 2004. On 15 August 2007, Nao replaced Sony's robot dog Aibo as the robot used in the RoboCup Standard Platform League (SPL), an international robot soccer competition. The Nao was used in RoboCup 2008 and 2009, and the NaoV3R was chosen as the platform for the SPL at RoboCup 2010. Several versions of the robot have been released since 2008. The Nao Academics Edition was developed for universities and laboratories for research and education purposes. It was released to institutions in 2008, and was made publicly available by 2011. Various upgrades to the Nao platform have since been released, including the 2011 Nao Next Gen and the 2014 Nao Evolution. Nao robots have been used for research and education purposes in numerous academic institutions worldwide. As of 2015, over 5,000 Nao units are in use in more than 50 countries. Aldebaran Robotics was established in 2005 by Bruno Maisonnier, who had previously begun developing the robot under "Project Nao" in 2004. Six prototypes of Nao were designed between 2005 and 2007. In March 2008, the first production version of the robot, the Nao RoboCup Edition, was released to the contestants of that year's RoboCup. The Nao Academics Edition was released to universities, educational institutions and research laboratories in late 2008. In the summer of 2010, Nao made global headlines with a synchronized dance routine at the Shanghai Expo in China. In October 2010, the University of Tokyo purchased 30 Nao robots for their Nakamura Lab, with hopes of developing the robots into active laboratory assistants. In December 2010, a Nao robot was demonstrated doing a stand-up comedy routine, and a new version of the robot was released, featuring sculpted arms and improved motors. In May 2011, Aldebaran announced that it would release Nao's controlling source code to the public as open source software. In June 2011, Aldebaran raised US$13 million in a round of venture funding led by Intel Capital. In 2013, Aldebaran was acquired by Japan's SoftBank Mobile for US$100 million. In December 2011, Aldebaran released the Nao Next Gen, featuring hardware and software enhancements such as high density cameras, improved robustness, anti-collision systems and a faster walking speed. The Nao Evolution, featuring enhanced durability, improved multilingual speech synthesis, improved shape and facial detection and recognition using new algorithms, and improved sound source location using four directional microphones, was released in June 2014. Aldeberan Robotics was acquired by SoftBank Group in 2015 and rebranded as SoftBank Robotics. Since 2011, over 200 academic institutions worldwide have made use of the robot, including the University of Hertfordshire and their Bold Hearts RoboCup Team, the Indian Institute of Information Technology, Allahabad, the University of Tokyo, the Indian Institute of Technology Kanpur, Saudi Arabia's King Fahd University of Petroleum and Minerals, University of South Wales and Montana State University. In 2012, donated Nao robots were used to teach autistic children in a UK school; some of the children found the childlike, expressive robots more relatable than human beings. In a broader context, Nao robots have been used by numerous British schools to introduce children to robots and the robotics industry. By the end of 2014, over 5,000 Nao robots were in use with educational and research institutions in 70 countries. In 2015, Mitsubishi UFJ Financial Group began trialling Nao robots for customer service use in its Japanese bank branches. In July 2015, Nao robots were shown to demonstrate a basic form of self-awareness in a philosophical experiment at Rensselaer Polytechnic Institute in New York, in which three robots were set up, muting two of them; they were then told that two of them had been given a "dumbing pill", and asked to figure out which of them hadn't. After initially replying he didn't know, the non-muted robot was able to figure out he hadn't been given the dumbing pill after hearing the sound of his own voice. In September 2015, the French Institute of Health and Medical Research used Nao robots to test a system of robotic "autobiographical memory" designed to help train International Space Station crews and assist elderly patients. Nao is available as a research robot for schools, colleges and universities to teach programming and conduct research into human-robot interactions. In August 2018, RobotLAB released an online learning platform for schools that enhance the use of NAO for STEM, Coding and Engineering. The various versions of the Nao robotics platform feature either 14, 21 or 25 degrees of freedom (DoF). A specialised model with 21 DoF and no actuated hands was created for the Robocup competition. All Nao Academics versions feature an inertial measurement unit with accelerometer, gyrometer and four ultrasonic sensors that provide Nao with stability and positioning within space. The legged versions included eight force-sensing resistors and two bumpers. The most recent version of the robot, the 2014 Nao Evolution, features stronger metallic joints, improved grip and an enhanced sound source location system that utilises four directional microphones. The Nao robot is controlled by a specialised Linux-based operating system, dubbed NAOqi. The OS powers the robot's multimedia system, which includes four microphones (for voice recognition and sound localization), two speakers (for multilingual text-to-speech synthesis) and two HD cameras (for computer vision, including facial and shape recognition). The robot also comes with a software suite that includes a graphical programming tool dubbed Choregraphe, a simulation software package and a software developer's kit. Nao is furthermore compatible with the Microsoft Robotics Studio, Cyberbotics Webots, and the Gostai URBI Studio. ^ "Nao robot replaces AIBO in RoboCup Standard Platform League". Engadget. 16 August 2007. Retrieved 4 October 2012. ^ "UK robots prepare for world cup". BBC. 25 October 2010. Retrieved 4 October 2012. ^ a b "Aldebaran Robotics announces Nao Next Gen humanoid robot". Engadget. 10 December 2011. Retrieved 15 April 2012. ^ a b c d e f g "Unveiling of NAO Evolution: a stronger robot and a more comprehensive operating system". Aldebaran Robotics. 2014. Retrieved 1 February 2015. ^ "RoboCup Standard Platform League". Tzi.de. Retrieved 4 October 2012. ^ "Robotic mascot entertains at Shanghai Expo". ChannelNewsAsia.com. 21 June 2010. Retrieved 4 October 2012. ^ a b "Le robot français Nao fait ses classes à l'Université de Tokyo" (in French). L'Express. Retrieved 4 October 2012. ^ "Heather Knight: Silicon-based comedy". TED. December 2010. Retrieved 4 October 2012. ^ "Aldebaran to Open Source NAO's code". Nao Developer. 13 May 2011. Retrieved 4 October 2012. ^ "Aldebaran raises $13 million in round led by Intel Capital". Aldebaran Robotics. 2011. Retrieved 4 October 2012. ^ "The Sad Story of Softbank's Aldebaran Robotics and its Emotionally Intelligent Robot". RudeBaguette.com. 15 December 2012. Retrieved 4 February 2015. ^ "Robot that walks, talks, emotes like humans...'Nao'". Times of India. 4 February 2013. Retrieved 8 February 2013. ^ Nash, Audrow (23 January 2015). "Robots: Looney the Robot". RobotsPodcast.com. Retrieved 10 February 2015. ^ "Nao, le robot que les universités s'arrachent" (in French). DigiSchool Média. 4 February 2013. Retrieved 16 February 2013. ^ "Robots in the classroom help autistic children learn". BBC. 8 November 2012. Retrieved 9 November 2012. ^ "AskNAO". Aldebaran Robotics. Archived from the original on 5 February 2015. Retrieved 1 February 2015. ^ "Robots found in the classroom". Active-Robots.com. 12 September 2014. Retrieved 1 February 2015. ^ "Japanese bank introduces robot workers to deal with customers in branches". The Guardian. 4 February 2015. Retrieved 4 February 2015. ^ "Polite robots show glimmer of self-awareness". Popular Science. 16 July 2015. Retrieved 23 December 2015. ^ "'Autobiographical memory' lets robots act as knowledge go-betweens for ISS crews". Gizmag.com. 8 September 2015. Retrieved 16 September 2015. ^ "For education & research". SoftBank Robotics. Retrieved 30 September 2016. ^ "Launch of Engage! K12". Markets Insider. Retrieved 6 August 2018. ^ Choregraphe User Guide. Aldebaran Robotics. Retrieved 1 February 2015. ^ "NAO NEXT Gen H25 Datasheet". Aldebaran Robotics. December 2011. Retrieved 4 October 2012. ^ "NAO Power V6 Standard Edition". RobotLAB. 2018. Retrieved 1 August 2018. ^ "NAO degrees of freedom (3D animation)". Retrieved 18 May 2018. Wikimedia Commons has media related to Nao. "My day with a robot". BBC News. 15 September 2015.